US President Barack Obama confirmed Sunday that the clock starts ticking January 20 on a six-month nuclear deal with Iran, which has agreed to temporarily limit uranium enrichment in exchange for an easing of sanctions against it. 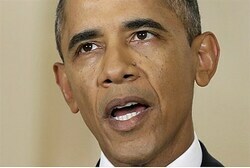 He also appealed to US lawmakers not to pass legislation slapping new sanctions on Iran. “We will now focus on the critical work of pursuing a comprehensive resolution that addresses our concerns over Iran’s nuclear program,” Obama said in a written statement Sunday. Under the agreement that Obama announced November 23, Iran agrees to limit its uranium enrichment to levels used to power energy plants, and to neutralize a nuclear stockpile that could be used to make weapons. Meanwhile, the United States, Britain, China, France, Germany, and Russia will ease some economic sanctions, while negotiating a permanent deal with Iran. “Today’s agreement to implement the Joint Plan of Action announced in November marks the first time in a decade that the Islamic Republic of Iran has agreed to specific actions that halt progress on its nuclear program and roll back key parts of the program. “Beginning January 20th, Iran will for the first time start eliminating its stockpile of higher levels of enriched uranium and dismantling some of the infrastructure that makes such enrichment possible. Iran has agreed to limit its enrichment capability by not installing or starting up additional centrifuges or using next-generation centrifuges. New and more frequent inspections of Iran’s nuclear sites will allow the world to verify that Iran is keeping its commitments. “Taken together, these and other steps will advance our goal of preventing Iran from obtaining a nuclear weapon. “In return, over the next six months the United States and our P5+1 partners – the United Kingdom, France, Germany, Russia, and China, as well as the European Union – will begin to implement modest relief so long as Iran fulfills its obligations and as we pursue a comprehensive solution to Iran’s nuclear program. “Meanwhile, we will continue to vigorously enforce the broader sanctions regime, and if Iran fails to meet its commitments we will move to increase our sanctions. “Unprecedented sanctions and tough diplomacy helped to bring Iran to the negotiating table, and I’m grateful to our partners in Congress who share our goal of preventing Iran from acquiring a nuclear weapon. Imposing additional sanctions now will only risk derailing our efforts to resolve this issue peacefully, and I will veto any legislation enacting new sanctions during the negotiation. A bill to slap new sanctions on Iran if it goes back on an interim deal under which it agreed to limit its nuclear program has gained support since it was introduced in December, aides to U.S. senators said last week. The bill requires further reductions in Iran’s oil exports and would apply new penalties on other industries if Iran either violates the interim agreement or fails to reach a final comprehensive deal. President Obama is opposed to the bill and has threatened to veto it even if lawmakers pass it.